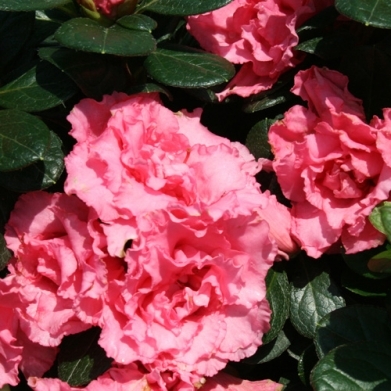 Listed below are our new flowering shrub offerings for Spring 2015. Many of these are being offered for the very first time and we are excited to be able to bring these new varieties to our customers. 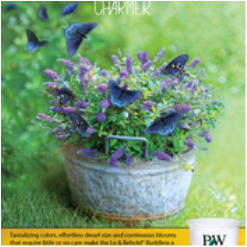 If you have not picked up your own copy of our complimentary catelog of Flowering Shrubs, please come on in. This is an excellent resource for planning your Fall gardening projects. excellent for Mixed borders and perennial beds. features seedless, fragrant, pink flowers. Deer Resistant. Plant in full sun and well drained soils. 4-6 feet tall, plant 4-6 feet apart. excellent for mixed borders and perennial beds. Features fragrant, seedless, white flowers. Deer Resistant. Prefers full sun and well drained soils. 4-8 feet tall, plant 4-8 feet apart. Features Sanagria-red summer flowers that will attract butterflies and hummingbirds to your garden. This compact fragrant flowering shrub is also deer resistant. 4-5 feet tall, plant in full sun in well drained soil with spacing of 5-6 feet apart. Fall in love with the Lo & Behold series from Proven Winners. 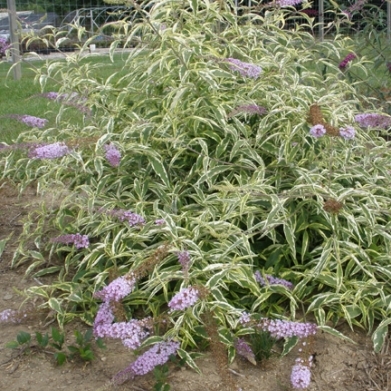 Buddleia Low & Behold Lilac Chip is a great ground cover for mass plantings; perennial gardens; and mixed borders. Features soft lavender-pink flowers that are fragrant and attractive to butterflies. This plant will rebloom until frost. Another outstanding feature - this dwarf plant is deer resistant. Prefers well drained soils. Plant in full sun and expect a habit of 1 1/2 feet to 2 feet tall. Plant 2 - 3 feet apart. Fall in love with the Proven Winner Lo & Behold series. This wonderful dwarf buddleia Lo & Behold Ice Chip makes a good ground cover for mass plantings; perennial gardens; and mixed borders. Featuring fragrant white flowers attract butterflies. This is a non-invasive, dwarf buddleia with lovely spreading habit. Deer resistant. 1 1/2 - 2 feet tall plant in full sun in well drained soil approximately 2-3 feet apart. Buddleia Lo & Behold Blue Chip, Jr. 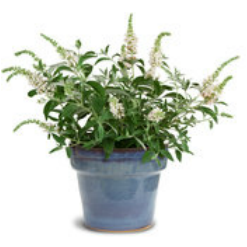 The next generation of Lo & Behold® 'Blue Chip' butterfly bush, young Junior is smaller, less brittle, and has attractive silver-green leaves. Great for mass plantings, containers or mixed into perennial gardens. This charmer flowers from mid-summer to frost. Available at better garden centers Spring 2015. Flowering a beautiful Blue Purple. Reaching full height at 20-28 inches with a spread of 20-28 inches. Compact; re-bloomer; non-invasive; drought and heat tolerant, attracts bees, butterflies, hummingbirds. Deer resistant. Small-miniature. Another dwarf introduction from the Proven Winner Lo & Behold series. It's great for perennial gardens and container gardens. Blue Chip also makes a fantastic mass planting. 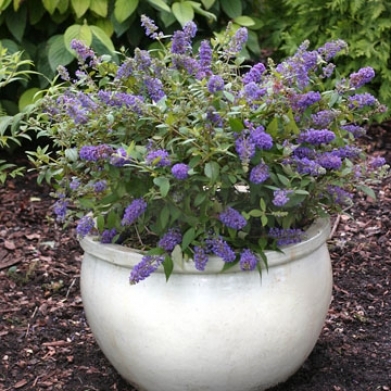 This Miniature butterfly bush has all the appeal in a smaller package! Flowers from mid summer to frost. Pruning generally not needed but may be trimmed in Spring. Fragrant flowers. Deer resistant. Attracts butterflies and hummingbirds. Best in well-drained soils. Height 2 - 2 1/2 feet tall. Space 2-3 feet apart. A showy accent plant for mixed borders and perennial beds. Features outstanding variegated foliage that provides interest throughout the season as well as fragrant violet-blue flowers. Attracts butterflies and hummingbirds. Deer resistant. 4-5 feet tall. Plant in full sun, well drained soil approximately 5-6 feet apart. Another lovely dwarf, very floriferous, deer resistant flowering shrub from Proven Winners. Excellent white flowers, beautiful fall color. Great for mass plantings, groundcover, or mixed borders. Plant in moist, well-drained soil in full sun. Height 1-2 feet, space 1-3 feet apart. It has taken about ten years but finally the first ever 'Nikko'-type deutzia with pink flowers. That's right, pink flowers on a low spreading deutzia. A shower of elegant pink flowers creates a carpet of color. Great for mass plantings because of its neat, mounded habit and rich burgundy-purple fall color. Available in better garden centers Spring 2015. 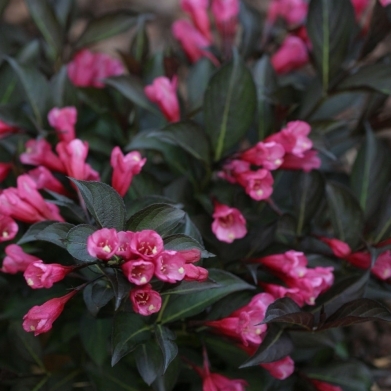 12-24 inches tall with a 12-24 inch spread, this small/miniature flowering shrub presents clear pink flowers with lovely green foliage turning an attractive burgundy fall color. Eco-friendly alternative to burning bush! This shrub pushes fall color to the limits with its glowing orange fall foliage. 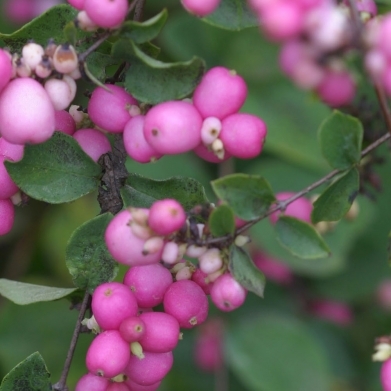 It lights up the fall landscape, making it an ecogriendly alternative to burning bush. Bright yellow flowers in early summer. A durable native that thrives in sun or shade. It's drought-toleran, deer-resistant, and can even grow in dry shade. 3-4 feet tall, 4-5 feet wide, plant in sun or shade, adaptable to most soils, including dry ones. prune to shape in Spring. Durable and dramatic dark purple foliage. Diervilla just got a lot more colorful. This tough, easy growing shrub is a standout with its dark burgundy-black foliage that is especially intense in spring and sutumn. The bright yellow flower panicles add contrast in early summer. A durable native that thrives in sun or shade. 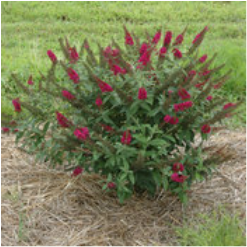 It's drought-tolerant, deer-resistant, and supports pollinator populations, .3-4 feet tall, 4-5 feet wide, plant in sun or shade. Hardy to -20°F Adaptable to most soils including dry ones.Prune to shape in early spring. A dwarf version of the larger Gardenia, Kleim's hardy Gardenias are beautiful inside and outside the home. Easy to care for, the are excellent or novice and experienced gardeners alike. These plants only grow 2-3 feet tall, so they fit perfectly anywhere in our landscape... even tight corners. It even stands up to tough winters, living up to its name. If your winters give your gardenias problems this is the plant for you. 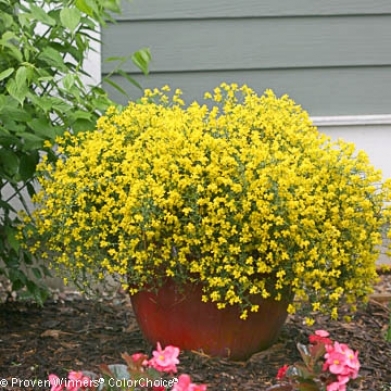 A floriferous, low mounding selection of Genista that produces waves of electric yellow flowers in spring. Improved branching and texture make this a wonderful plant for containers and for mass plantings. Bangle has an interesting texture and is incredibly showy in the landscape, especially when in bloom. Better Homes and Gardens listed 'Bangle' as one of 18 Best New Trees and Shrubs of 2008. Plant in full sun in well-drained soil. Height 1-2 feet, space 2 feet apart. 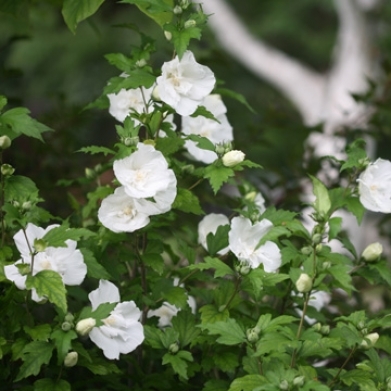 An eye-catching, new Rose of Sharon with brightly variegated creamy-white and bluish-green foliage. It produces loads of clear pink, double flowers and does not produce seed like older cultivars. This is a beautiful plant that will look great in your garden all summer.Adaptable to most well drained soil types, plant in full sun. Height 8 - 12 feet, space 5-7 feet apart. 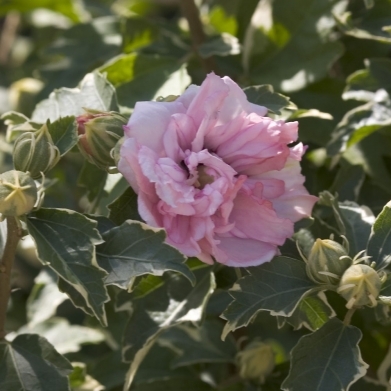 An eye-catching, new Rose of Sharon with brightly variegated creamy-white and bluish-green foliage. It produces loads of clear lavender, double flowers and does not produce seed like older cultivars. This is a beautiful plant that will look great in your garden all summer. Excellent for landscape use. Young plants can be used in containers but will need to be moved to the landscape as they mature. Absolutely incredible when pruned into a small tree. Deer resistant. 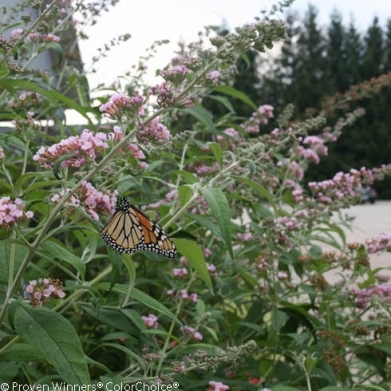 Attracts butterflies, Adaptable to most well drained soils, Height 8 - 12 feet. Plant in full sun 5-7 feet apart. 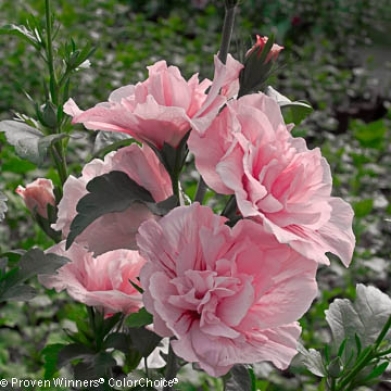 This beautiful newHibiscus from Proven Winners has the same flower power and soft, graceful stems of other Chiffon varieties, but with large, soft pink flowers. 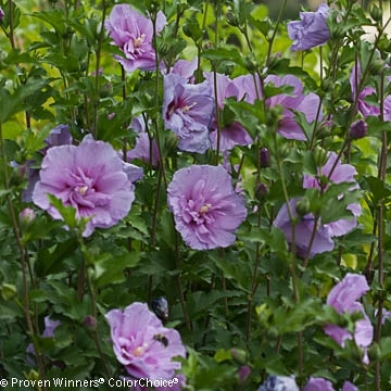 The distinctive, clear pink of Pink Chiffon is an unusual addition to summer gardens. 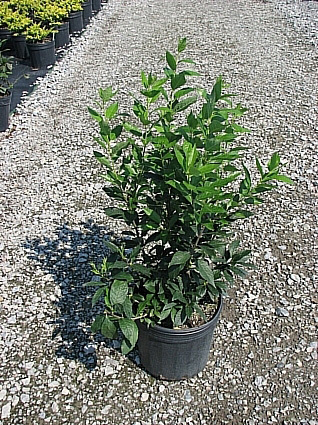 Great large shrub for landscape use. Can be trained into small tree. Large, lacy pink summer flowers. An easy to grow very adaptable plant. Deer resistant. Attracts butterflies. 8-12 feet tall, plant in full sun and space 6 - 7 feet apart. A whole new look for hardy hibiscus! Large single flowers are adorned with a lacy center to create an anemone-like bloom. 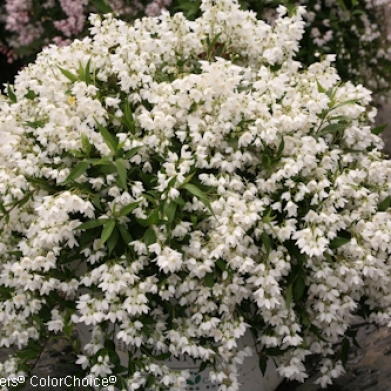 White Chiffon's pure white flowers are lovely in any garden and work well with most other plants, especially dark foliage plants like Wine & Roses weigela and Black Lace elderberry. Hibiscus are reliable summer bloomers that offer the gardener an easy way to bring the tropics to the mainland. You’ll appreciate their strong and vigorous growth compared to older varieties. Adaptable to most well drained soils. Plant in full sun. height 8 - 12 feet, space 6 - 7 feet apart. 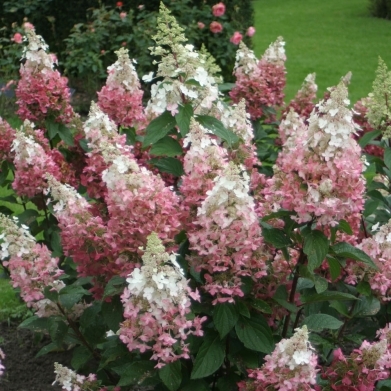 The Annabelle Hydrangea is an ornamental shrub with outstanding flowers. Plant one near a high traffic area so you don’t miss a moment of this plant’s spectacular blooms. No words can truly describe the sight of a 5 foot tall rounded shrub covered in enormous clusters of flowers that consist of a multitude of tiny white blossoms, gathered together into gigantic bouquets that blanket the Hydrangea in color. It’s a spectacular sight unlike any other, and your Hydrangea will reproduce that spectacle all summer long and year after year. The dark green foliage is a perfect contrast for the pristine white of the flowers, furthering the staggering effect of this vision in floral perfection. It simply has to be seen to be believed! 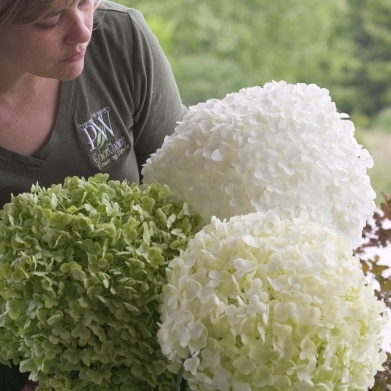 Your Annabelle Hydrangea will grow 3-5 feet with an equal spread and begins to create its stunning blooms in June, which continue for 2 months. As if that’s not enough, your Hydrangea will bloom a second time before the end of the season. You’ll look and hard to find another flowering plant that grows as easily as this Hydrangea, or produces as dazzling a display of flowers through the entire summer. This adaptable native plant produces huge flowers (as much as 12" across). Flowers open green, then mature to white before turning green at the end of their life cycle. reliable and beautiful. Very cold hardy Incrediball blooms on new growth so even very cold winters won't keep it from blooming. The flowers are held upright on very sturdy stems, so they don't flop like 'Annabelle' will. Watch the video about Incrediball Hydrangea right here! Adaptable to most well drained soils. Sun or partial shade. 4-5 feet tall, space 5-6 feet apart. Another answer to those floppy, weak stemmed hydrangeas, especially when they’re in full bloom. Proven Winner Hydrangea Cityline Paris! A new and improved hybrid from Germany has tight sturdy stems and is extremely mildew resistant. This maintenance free plant will require no pruning and that results in more flowers the next coming summer. Its intense fuchsia color will pop in your garden and fill your home with beautiful fresh or dried cut flowers. The flowers age quite nicely into fall as well. prefers moist well drained soils. Height 1 - 3 feet, plant in sun or part shade 3-4 feet apart. Very hardy hydrangea displays white summer flowers that turn a beautiful red in fall. Garden height 54-72 inches with a spread of 54-72 inches. Abundant white summer flower turn pink in Fall. Blooms every year. Hardy. Soil pH does not affect bloom color. Dwarf. Garden Height 30-36 inches with a spread of 36-48 inches. 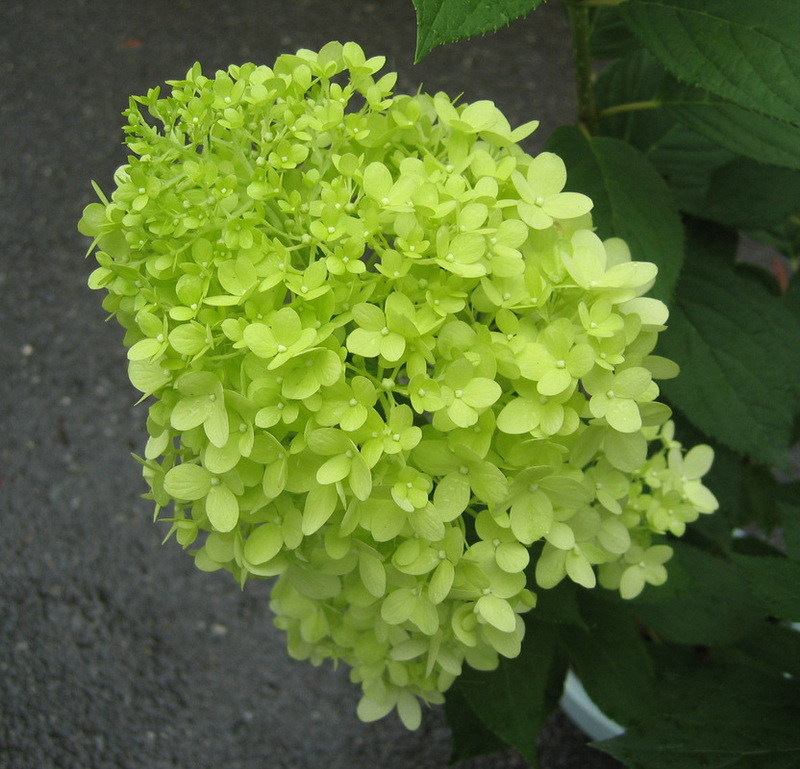 An exciting hardy Hydrangea, unique bright chartreuse blooms in mid-summer that hold bright and refreshing color right into autumn. 6 - 8 feet tall, about 6 feet wide. Sun - Part Shade. 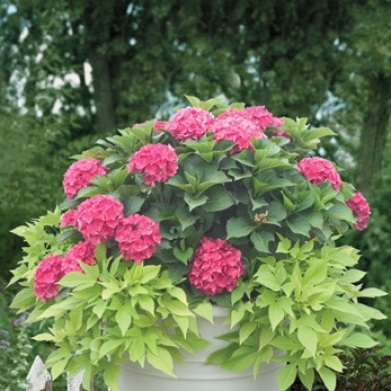 Dwarf hydrangea produces green summer flowers that turn pink in fall. Dwarf 'Limelight'. Blooms every year. Hardy. Garden height 36-60 inches with a spread of 36-60 inches. Pinky Winky has an unusual name, and an even more unusual flower. The large white panicles open in mid to late summer, and as summer turns to fall the florets at the base of the panicles turn pink. The flower panicles continue to grow, producing new white florets at the tip. The result is spectacular two-toned flower panicles that can reach up to 16 inches in length! This is a real show-stopper that's also very easy to grow. Adaptable to most soils and both sun and shade, Pinky Winky will thrive in most gardens.Adaptable to most well-drained soils. 6-8 feet tall, plant in sun or partial sun and space 6 - 8 feet apart. A lovely, medium size, oak-leaf hydrangea featuring white flowers. Beautiful broad oak shaped green leaves turn a striking burgundy in Fall. Tolerant of most soils, but prefers well-drained locations. It will benefit from a trimming in spring and after flowering. This is an excellent groundcover subshrub for part shade. 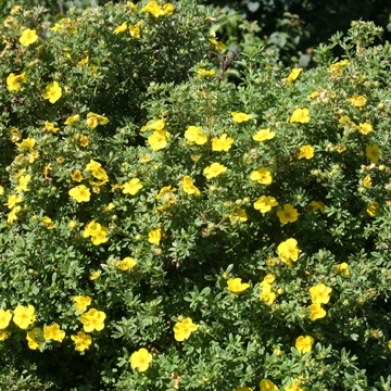 Features yellow flowers, deer-resistant, olden foliage. Garden height 12-18 inches with a spread of 12-24 inches. 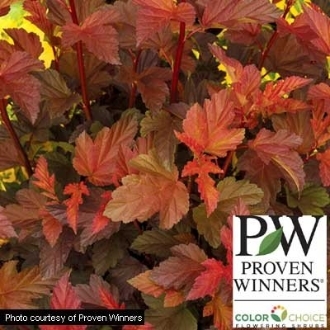 Smaller than its sister Sky Pointer™, Patty O has smaller, darker leaves and glossier foliage. Much darker than typical I. crenata, this petite evergreen is perfectly scaled for smaller gardens and patios, and is perfect for flanking formal entryways. Prefers oist, acidic soils with ood drainae. Fertilize with a controlled release fertilier in sprin. Prunin is seldo needed, but may be trimmed in summer. Garden height 36 - 48 inches, with 12-24 inch spread. 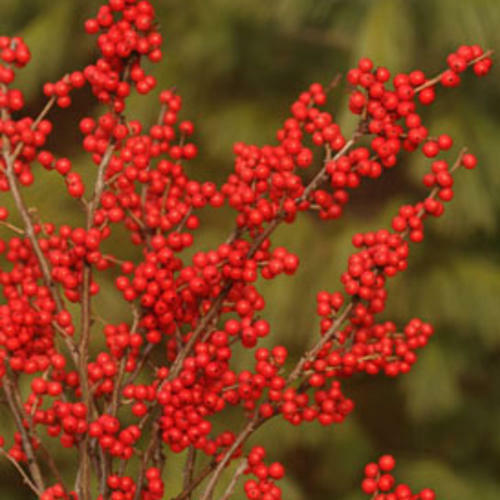 Vivid red winter berries are great for cuts or adding color to the landscape. Use Jim Dandy as pollinator. Mildew resistant. Native. 6-8 feet tall, up to 10 feet wide. Hardy, adaptable shrub. Drought tolerant once established. Produces deep green leaves. Male cultivar - great pollinizer for female cultivars such as Berry Nice and others. 3-6 feet tall, 4-5 feet wide. Soft textured evergreen with colorful foliage. Spreading habit. Deer resistant. Drought tolerant. Unlike any other juniper, this beauty is soft to the touch and provides dynamic, seasonal color changes. In the spring it emerges an attractive chartreuse hue, changes to bright yellow and then takes on orange hues in the autumn. A sport of 'Hughes', it has the same spreading, horizontal habit and easy to grow, drought tolerant culture. Garden Height 12-18 Height, with 80-108 inch spread. 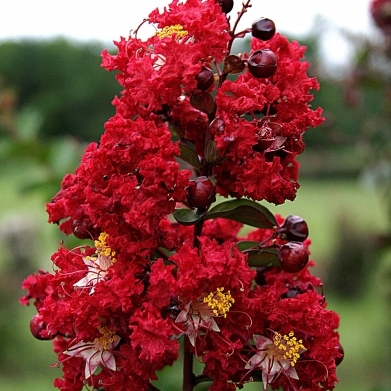 The first true red tree form crapemyrtle! Dynamite produces cherry red flowers even in full sun and hot conditions. It is both drought and mildew resistant. Best in medium moisture, well drained soil and full sun. A good specimen plant or as part of the mixed border. Prefers Moist, well drained soils, Height 10 - 15 feet, plant in full sun about 12 - 20 feet apart. Dwarf Crepe Myrtle - low, arching plant has lots of flowers. This compact plant has loads of showy lavender-purple flowers. Fits easily into landscape and container designs. Hardy to temperatures around 0°F. A truly excellent specimen plant, foundation planting, mixed borders, and/or containers. Height 2 - 4 feet with a spread of 3-5 feet. Compact size and continuous blooms! The Infinitini series has a small habit that is perfect for containers, and also flowers all summer! You'll have more flowers in less space with this fun new variety. It's a ball of bright pink flowers that bloom all summer long! hardy to about 0°F. Excellent as a specimen plant, containers, foundation planting, and mixed borders. Garden height 2-4 feet, with a spread of 3 - 5 feet. Compact and loads of flowers! The Infinitini crapemyrtles were selected for their outstanding container presentation and colorful, abundant blooms. This is a heavy blooming, dense, mounded plant with rich, dark pink-red blooms and clean foliage. hardy to about 0°F. Excellent as a specimen plant, containers, foundation plantings and mixed borders. Garden height 2-4 feet, with a 3-5 foot spread. 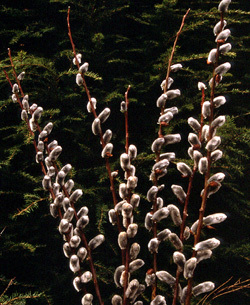 Russian cypress is a hardy, low growing evergreen for sun or shade, but the species is often plagued with tip die-back. This new selection solves that as it has superior disease resistance and winter color. Celtic Pride's green foliage turns an attractive russet color in winter. This is an excellent, very cold-hardy plant with better shade tolerance than junipers. Deer resistant requires little to no pruning. 1-3 feet tall, plant in moist well drained soil in sun or partial sun 5-6 feet apart. Physocapus- A new hybrid between Dart's Gold and Diabolo that flushes an attractive copper in spring and transforms to a rich red in summer. Soft pink flowers line the gently arching branches in early summer. This is a very tough plant, ideal for difficult sites. Adaptable to most soils, 6-8 feet tall, plant in full sun about 7 - 10 feet apart. Twice as nice as other azaleas! Why settle for just a week or two of flowers when you can enjoy up to five months of blooms? Large flowers appear in April, then rebloom in early July, continuing through fall until hard frost. Even high summer temperatures don't stop this beauty from producing loads of late summer and fall flowers. The evergreen foliage is disease resistant, and maintains excellent color year-round. Flowering lasts for 4-6 weeks in spring, and then another 12-16 weeks in summer and fall. Prefers fertile, well-drained soils. About 3 1/2 feet tall, plant in partial sun about 3 - 4 feet apart. 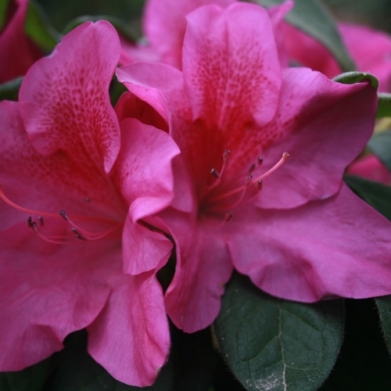 Twice as nice as other azaleas! Why settle for just a week or two of flowers when you can enjoy up to five months of blooms? Large flowers appear in April, then rebloom in early July, continuing through fall until hard frost. Even high summer temperatures don't stop this beauty from producing loads of late summer and fall flowers. 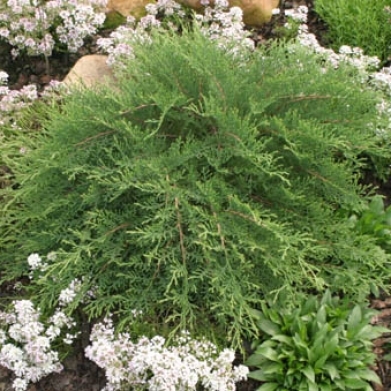 The evergreen foliage is disease resistant, and maintains excellent color year-round. Flowering lasts for 4-6 weeks in spring, and then another 12-16 weeks in summer and fall. Prefers fertile, well-drained soils. 3 feet tall, plant in partial sun about 4-5 feet apart. 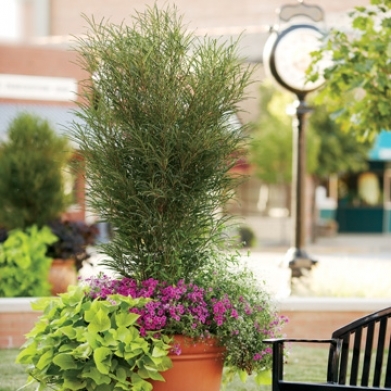 A great landscape plant, FINE LINE® combines the feathery foliage of ‘Aspenifolia’ with the narrow upright habit of ‘Columnaris.’ Use FINE LINE® in narrow hedgerows for privacy, as an accent plant, or even in a patio container. It’s a great vertical accent for the perennial garden, and the narrow habit is perfect for framing entrances. This is an extremely useful, architectural plant for the home or commercial landscape. This cultivar produces very few fruit, none of which have been shown to be viable. FINE LINE® is a responsible and environmentally friendly replacement for weedy, older varieties. Non-invasive. Deer resistant. 5-7 feet tall, Adaptable to most soils and conditions, sun or part shade. Plant 2 - 4 feet apart. A rich pinkish-lavender, heavily flowering form of 'PJM' rhododendron, 'Amy Cotta' is a slow growing, semi-dwarf form perfect for sites which call for a compact flowering evergreen. 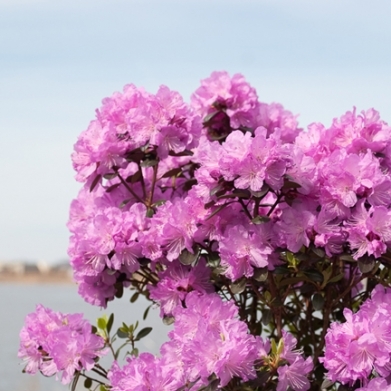 Dense, azalea-like foliage is smaller and darker than that of 'PJM'; plentiful ruffled blooms cover the plant in early spring. Good for foundation plantings, woodland gardens, mixed borders. Prefers moist, well-drained soils with pH 5.5-7.5. Plant in sun or partial shade. 2-3 feet tall. Plant 4 1/2 - 5 1/2 feet apart. There has never been a plant with such appeal. 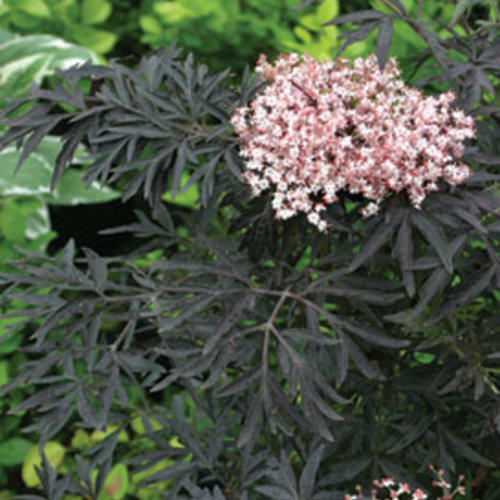 Black Lace is reminiscent of a Japanese Maple with its lacy purple black foliage. Even better, it produces massive pink flowers that reach 6" in diameter. Its color and texture make it a great plant for the perennial garden, patio container, or the entrance garden. Check out this showy new cutleaf elderberry with bright golden foliage! It's a colorful, shaggy mound of gold threads with colorful reddish new growth. The foliage is more deeply cut than 'Sutherland Gold' or Black Lace™ resulting in a compact irregular mound with extremely fine texture. White spring flowers produce red fruit in fall. Will tolerate full sun in northern climates, but prefers light shade in more southern areas. A Plant of Merit and People's Choice Award winner at the 2014 Farwest Horticulture Trade Show, Lemony Lace Sambucus also won a Green Thumb Award from the Direct Gardening Association.. Features cutleaf foliae, red all fruit. Deer resistant. Native North American Plant. Garden height 36-60 inches with a spread of 36-60 inches. Bloomerang lilacs are two-timers - and that's a wonderful thing! They bloom in spring like traditional lilacs, then rebloom from mid-summer through fall. Dark Purple is bigger than the original Bloomerang Purple lilac, and has larger, more rounded inflorescenses. This is a strong grower, and will add beauty and fragrance to gardens from spring to fall. Stands about 48-72 inches tall with a spread of about 48-72 inces. 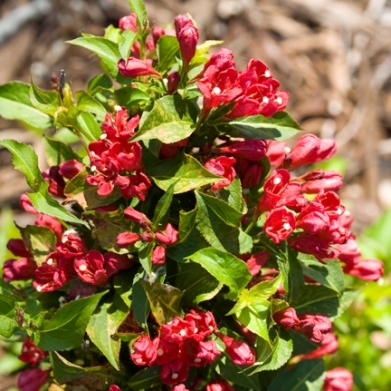 The lipstick red flowers are remarkable enough to make this a choice selection, but a burst of flowers in May followed by waves of rebloom until frost make it a must-have shrub. Deadheading is not needed to keep the plant blooming. Adaptable to most well-drained soils. 4-5 feet tall, plant in sun or partial shade about 5-6 feet apart. Isn’t it romantic! Rosy-pink flowers add a touch of romance when displayed against the dark glossy foliage. The foliage is much darker than that of older varieties like Java Red. It contrasts beautifully with the rosy-pink flowers, making for a high impact display in the garden. This variety produces copious amounts of flowers in spring, and will re-bloom throughout the summer. The trumpet-like flowers are adored by hummingbirds! Try using WINE & ROSES® colorful branches in flower arrangements. It can also be enjoyed as an accent plant or used for a dramatic mass planting. It is fast growing and trouble free, making it an easy way to add season long color to the garden. Adaptable to most well-drained soils. Height 4-5 feet, plant in full sun about 5-6 feet apart. 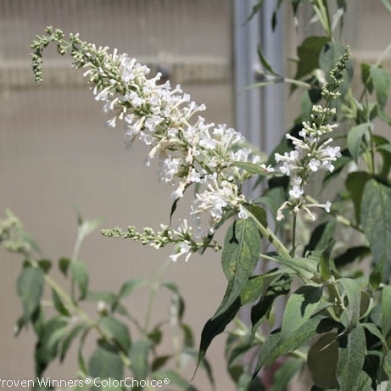 Large upright shrub; 10-12' tall and wide; very large; 3" long, silvery-white to pinkish-white catkins in early spring followed by yellow-orange anthers that stick out of the catkin; full sun; adaptable to most soils and pH; prefers moist, well-drained soil but is tolerant to wet soil; do not shear; native to Japan; hardy to zone 5b. Bush Cinquefoil Happy Face - The flowers are so big and bright the flowers will stand out from all others! It produces an abundance of big yellow flowers from spring until late summer. Its dense habit and dark, healthy foliage add to its appeal. This is a wonderful, low-maintenance plant for adding bright color to the summer landscape.Compact habit, deer resistant - a North American Native. Prefers well drained soils but will adapt to dry conditions once established. 2-3 feet tall, plant in full sun about 2 - 4 feet apart. The vivid color of this coral berry makes it superior to other varieties. The vibrant hot pink fruit is much brighter and showier in the landscape than that of other coral berry cultivars. AMETHYST™ has good branching and a neat habit, unlike the rangy forms seen in many older types. This is a great plant to include in the home garden. It provides vivid color in mid-summer, and works nicely in informal woodland type gardens. It has been reported to be somewhat deer resistant. Adaptable to most soils with medium moisture. 3-5 feet tall, plant in full sun about 4-6 feet apart.